Dr. Wendy Wood (the Co-PI) and Dr. B. Caitlin Peters. Horses and Humans Research Foundation awarded a $50,000 grant to theTemple Grandin Equine Center, Colorado State University to research The Feasibility, Acceptability, and Preliminary Efficacy of a Manualized Equine-assisted Occupational Therapy Intervention for Children with Autism.This research study is actually phase two of a comprehensive four phase study that tracks not only the effects of equine assisted occupational therapy for children with autism, but also the feasibility of the intervention and the retention and impact of results. Principal Investigator, Dr. B. Caitlin Peters, stated that ideally the final long term results will beto disseminate an intervention manual allowing occupational therapists at riding centers across the globe to easily provide an evidence-based intervention to children with autism. 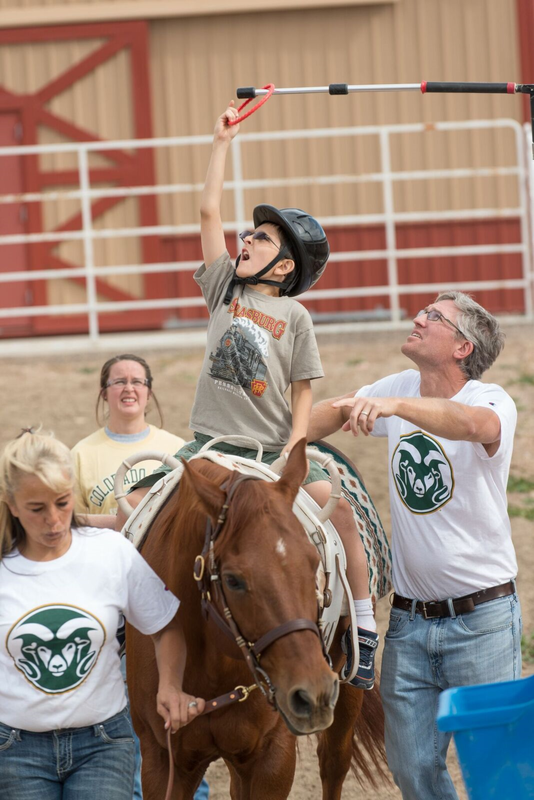 Therapeutic riding centers serve individuals with autism more than any other group. Equine-assisted occupational therapy (EAOT) integrates horses into occupational therapy treatments to improve the social and behavioral functioning and related occupational performance of children with autism. This study aims to determine if a manual that outlines how to provide EAOT to children with autism is feasible to implement, and is acceptable to therapists and participants. The project will also assess the impact of EAOT on individual occupational performance goals, social functioning, behavior, and chronic stress of children with autism. This appears to be the first study of an equine-assisted therapy for children with autism to a) assess feasibility and acceptability of a manualized intervention, b) use random assignments to treatment or control groups, and c) assess outcomes with blinded raters and physiological indicators. Measures will include areas such as surveys, focus groups, participant attendance, assessment completion, drop-out rates and fidelity to the intervention manual as indicators of feasibility of implementation. The effect of EAOT on children with autism will be measured before and after the intervention through established assessments ratings as well as collected hair samples that will be analyzed for cortisol content, an indicator of chronic stress. The results of this study will be used to design a future, large-scale randomized clinical trial. In addition, the results will be used to improve the EAOT intervention manual. The long-term goal is to determine if EAOT is an effective intervention for children with autism. If so, the intervention manual can be disseminated so that occupational therapists can provide evidenced based therapy sessions for their clients.